The Oregon Ducks opened their 2018 home season with a 14-0 shutout of the Seattle RedHawks Tuesday evening at PK Park. The Ducks wasted no time in taking control of the game, scoring three runs in the opening frame then adding a 10-spot in the second. Second baseman Kyle Kasser kick started the Oregon offense with a lead off single, then scored on Spencer Steer’s double. Freshman shortstop Ryne Nelson drove in run number two with an infield single with Steer scoring on the front end of a double steal to give the Ducks an early 3-0 lead. Starting pitcher Cullen Kafka surrendered a one-out double down the right field line in the top half of the second but escaped unscathed by coaxing the next two Seattle hitters into ground ball outs. Oregon sent 15 batters to the plate in the home half of the second, blowing the game open with five hits, four walks a pair of hit batters, an error and a balk. Oregon added a run in the seventh on a pair of walks and a fielder’s choice. 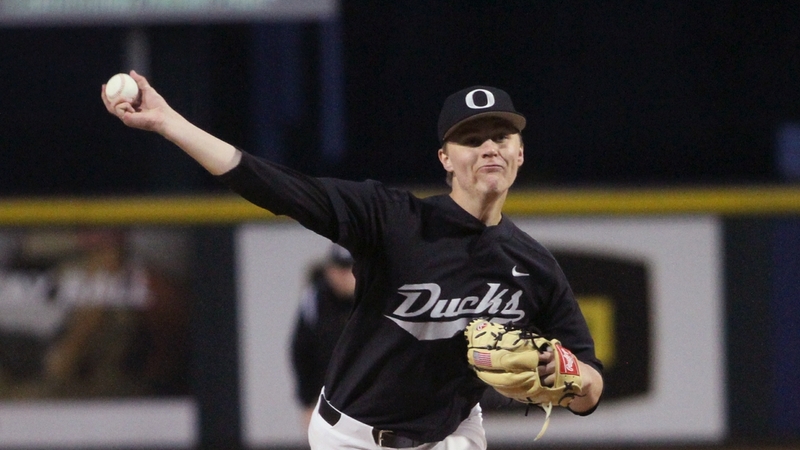 Six Oregon pitchers combined for the shut-out with Kafka picking up his first win of the year after allowing two hits and no runs in three innings of work. As a staff the Ducks allowed six Seattle hits while striking out 12 and walking none. The Ducks banged out nine hits with Steer leading the way, picking up three hits and three RBI. With the win the Ducks improved their record to 5-2 on the year while the RedHawks slip to 5-3. Oregon’s home stand continues with the Ducks hosting Florida Atlantic for a four game set beginning Friday night. First pitch is set for 6:00 pm.